My new obsession over at splitcoast is trading. They have a buy/trade/sell forum that I've been stalking lately. 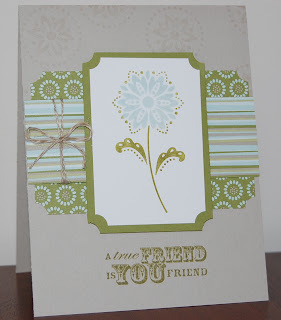 The stamp set used in this post "true friend" is one that I got in a trade. I love it and have had my eye on it since I first saw it in the mini catalog. I've had three successful trades so far and I'm looking forward to getting some more new goodies to play with!